Miami-Dade narcotics detector canine Franky, who came out of retirement to give a demonstration, sniffs for marijuana in Miami on Dec. 6, 2011. 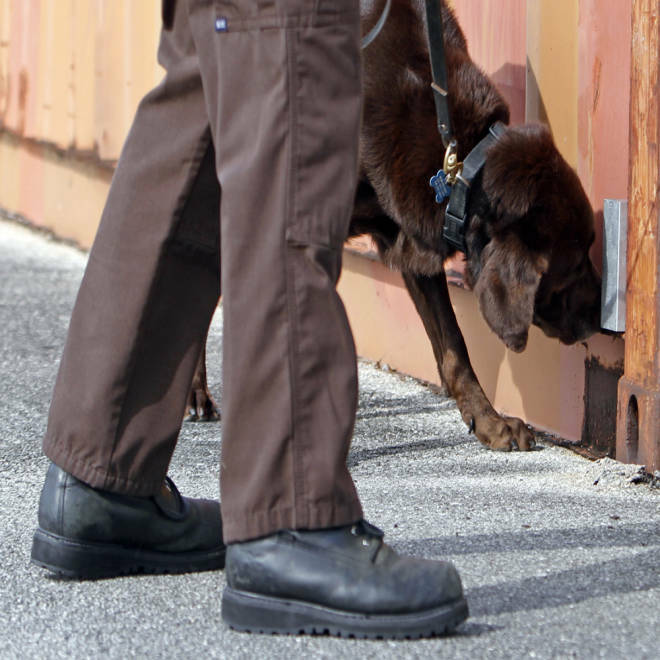 The use of a drug-sniffing dog by police outside of a home where they suspected drugs were being grown constitutes a search under the Fourth Amendment, the Supreme Court said in a decision handed down Tuesday. The case, Florida v. Jardines, dealt with whether police could use trained canines to investigate the immediate surroundings of a home for drugs they suspected were being grown inside, but could not see. Officers from the Miami-Dade Police Department approached Joelis Jardines’ home with a drug dog in 2006 after receiving a tip that marijuana was being grown in the house. The animal alerted officers to the presence of marijuana in the house, after which officers obtained a search warrant and discovered the plants. The justices affirmed the Supreme Court of Florida’s decision to suppress the evidence by a 5-4 vote. Justice Antonin Scalia delivered the court’s opinion. “To find a visitor knocking on the door is routine (even if sometimes unwelcome); to spot that same visitor exploring the front path with a metal detector, or marching his bloodhound into the garden before saying hello and asking permission, would inspire most of us to – well, call the police,” Scalia wrote. This is the second of two police dog cases the court has delivered opinions on this term, both originating in Florida. In a February decision in the other case, Florida v. Harris, the court ruled that an alert by a trained police dog gave police officers probable cause to further search a vehicle. Will police dogs pass Supreme Court sniff test?